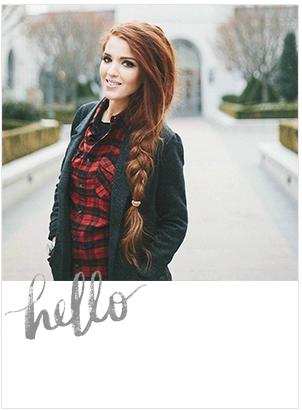 The Freckled Fox: A 'Last of Summer' Giveaway from GUESS! A 'Last of Summer' Giveaway from GUESS! First on the little list is this fun and girly authentic GUESS by Marciano shoulder bag from the Queen Bee Collection! The body is made of synthetic straw with black patent croc-embossed contrast trim. The butterfly and other hardware are made of silver with an interior tab that has a magnetic snap closure. Lastly this little number has butterfly print lining inside as well as one zip pocket and three open pockets. 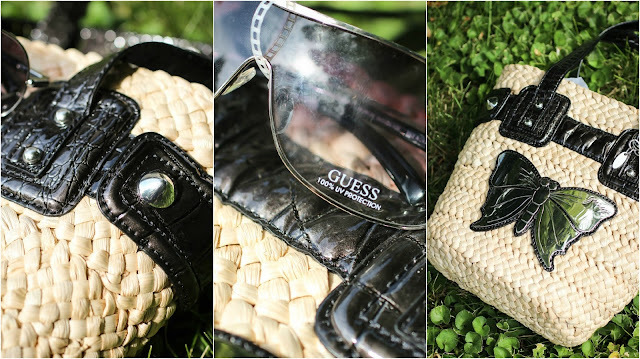 Also included with the purse is this cute pair of Authentic GUESS 100% UV protection Sunglasses! These babies have a black and grey gradient polycaronate lens on a silver frame with black tips. These items together have an equal value of around $200, not that that matters at all though right? :) Alright lets get to the good part! And that's it! 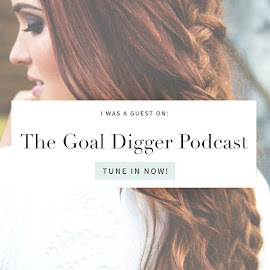 Thank you so much for all your awesome support of me and my blog! I really love you guys:) Thanks also for stopping by, I'll see you again soon, and good luck with the giveaway! First of all I love that they are GUESS, and I love love the style of the bag, so pretty! My favourite thing done this summer? Hands down going to some Independent Christian Film sets, working pre-production and being head make-up artist/wardrobe stylist on some film shorts. You get to meet and get to know so many incredible people there, and I love the friendships that are created during the somewhat stressful (yes SO rewarding) environment. The favorite thing was taking my kids to the swimming pool/park, they had a blast and made memories. 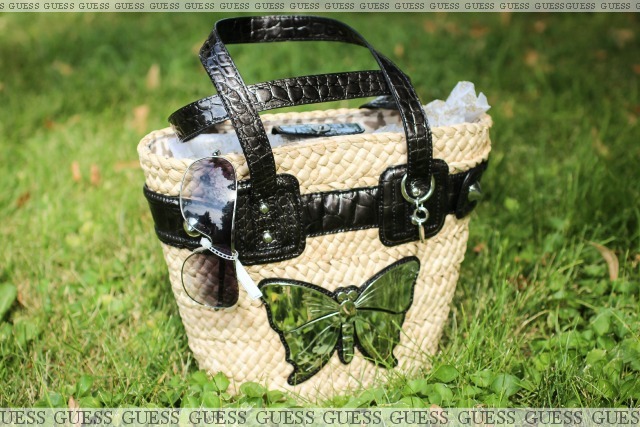 This Guess bag is absolutely marvelous! I went to Washington DC and Vegas over the summer. It was early so it feels like a really loooong time ago! Looking forward to Maui in December. This summer has been pretty nice, but I must admit to loving winter more. 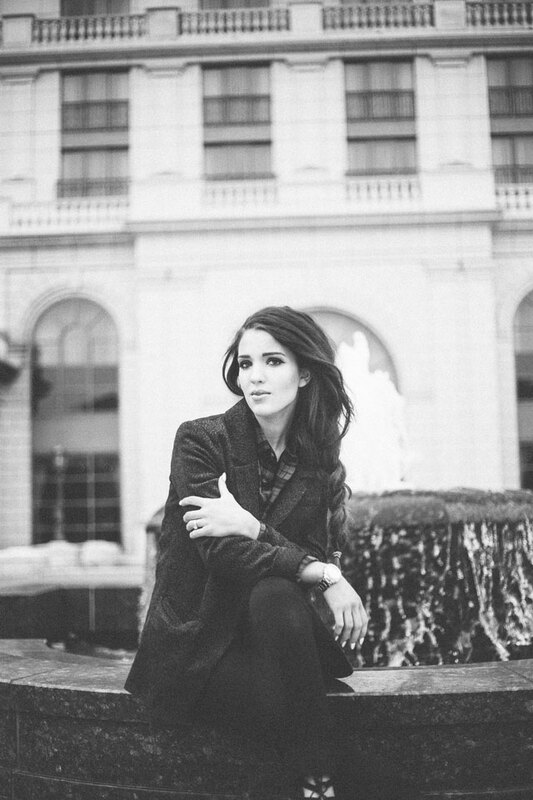 My love and I have just been taking it easy because I am pregnant with our first! We try to take our dogs to the lake ever chance we get, which is always my favorite part of summer. Love the shoulder bag! My favorite part of the summer was spending time with my friends and having weekly cookouts with my cousins. Thanks for the giveaway, hoping its international. Best part of the summer was spending time with family and friends. The bag is super cute! My favorite part of summer is the weather and time off! My favorite thing that I did this summer was say YES to the love of my life on June 16th!!! I cannot wait to marry this man next year! My favorite thing I did this morning was say "YES" to the love of my life on June 16th!! I cannot wait to marry this man next year!! My fave thing that we did this Summer was go to Maine for a few days. It's always nice to get away. My favorite part of this summer is our lovely garden. The flowers have all been blooming and now all the vegetables are about to be ready! love how girly it is! I have spent my summer at the beach with my daughter. We have had so much fun building sand castle's and playing at the pool and the ocean! I love anything with butterflies on it! This is such a pretty hand bag/tote! and what did i do this summer? i spent my holiday in Bangka island, Indonesia. iT's so beautiful. come and visit it..